A classy win by a classy horse. Cirrus Des Aigles romps home in the Coronation Cup. 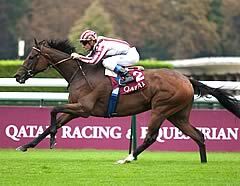 Cirrus Des Aigles won one from his first ten and didn't land his first Grade 1 until he'd had nearly 40 starts. Jockey Christophe Soumillon dismounted soon after the finishing line as Cirrus Des Aigles appeared to be lame. Corine Barande-Barbe: "How you say in English? A hat-trick? "He was a little lame after the post. He is better now. Nothing serious happened. I am not worried." Christophe Soumillon saluted the crowd after partnering the remarkable Cirrus Des Aigles to a smooth victory in the Investec Coronation Cup at Epsom. Corine Barande-Barbe's wonderful eight-year-old was winning at the highest level for the sixth time and recording the 21st success of his stellar career. Soumillon settled him in fourth and appeared to have everything covered two furlongs out, but Andre Fabre's Flintshire still posed a threat. The veteran pulled out plenty when challenged, however, and was a comfortable two-length winner as the 10-11 favourite. Ambivalent, who led for most of the way, stayed on for third place. Unfortunately Soumillon jumped off on passing the post, feeling his mount had gone lame. The jockey said: "When he changed legs he did something he never does really. When he passed the post he didn't really feel right. Hopefully it isn't anything too bad. H e's an amazing horse." Cirrus Des Aigles was trotted up and down on the track before returning to the winner's enclosure seemingly more sound. Barande-Barbe said: " He was a a bit lame on passing the post but is a bit better now, nothing really serious has happened, but you don't like to see it when a horse is lame. "When you touch it you can see nothing, neither can the vet. Maybe he missed a step, I don't know. I'm not really worried but I prefer to be able to say tomorrow that he is OK.
"He's very proud of himself and you can usually tell when something is wrong with him, he always shows you, that is what he did in Hong Kong. In the morning if he has a little hole (in his tendon) I will be able to tell when I touch it, he doesn't show it now. "I think he's a fighter because he changed his distance (from his last race) and he has travelled to England and raced on a track that goes up and down, but he did it very well. That's his third Group One in a row. What do you call it? A hat-trick, so I'm very proud. "He won't go to Royal Ascot, that will come too soon, his next race will be hopefully the Grand Prix de Saint-Cloud." Teddy Grimthorpe, racing manager to Flintshire's owner Khalid Abdullah, said: "It was his first run since the Arc and we're very happy with that. He's going to get better and this could be the start of a very interesting season for him. He won't go to Ascot, but could go for the Grand Prix de Saint-Cloud." Roger Varian said of third home Ambivalent: "That was another really respectable run to finish just behind two very good boys." The Coronation Cup was first run in 1902 to commemorate the coronation of a new British monarch, King Edward VII. Epsom had previously staged a similar race, the Epsom Gold Cup, which was open to horses aged three or older. The Coronation Cup was temporarily switched to alternative venues during wartime periods, with runnings at Newmarket (1915–16, 1943–45) and Newbury (1941). The race is presently contested on the opening day of Epsom's two-day Derby Festival meeting. Its distance is the same as that of both the Derby and the Oaks, and it often features horses which competed in those events in the preceding seasons. The Group One mile and a half contest for older horses boasts an outstanding roll of honour, featuring greats such at Mill Reef, Rainbow Quest, Triptych, Daylami, Yeats and more recently St Nicholas Abbey, who made the race his own.